Summary from Ms. Cremer's Website: While other teenage girls daydream about boys, Calla Tor imagines ripping out her enemies’ throats. And she wouldn’t have it any other way. Calla was born a warrior and on her eighteenth-birthday she’ll become the alpha female of the next generation of Guardian wolves. But Calla’s predestined path veers off course the moment she saves the life of a wayward hiker, a boy her own age. This human boy’s secret will turn the young pack's world upside down and forever alter the outcome of the centuries-old Witches' War that surrounds them all. Another book about wolves!! I am loving all of the wolf/werewolf books that are being published (I think I've said that before, but it bears repeating). The summary is what really drew me to Nightshade, that and the strong female lead. I like that the main character will be the female Alpha of her pack. It's nice to see the typical werewolf/shifter story changed so that females have equality and are also leaders. 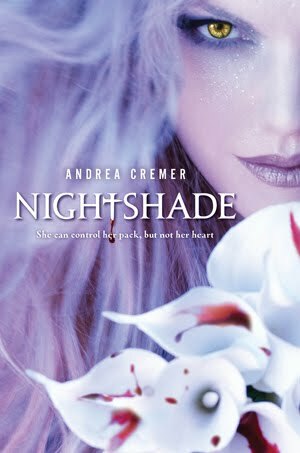 Want more information about Nightshade? What are you "Waiting On" this Wednesday? Thanks for stopping by BookSake! I love the cover to this! I'm waiting for this to come out as well. I can't wait to read this one! Werewolves are the best. :-) Great pick! This sounds so good! I'm looking forward to this one too.